Posted by Laura Arnold in Indianapolis Power and Light (IPL), Uncategorized. Indianapolis, IN – Today (11/28/2012) dozens of concerned ratepayers and community members gathered at Monument Circle to mark the launch of the Sierra Club’s Indianapolis Beyond Coal Campaign by delivering a growing list of 2,000 petitions to Indianapolis Power and Light’s (IPL) Headquarters opposing rate increases to keep IPL’s aging coal plants online and asking instead that IPL move toward clean energy. The negative impacts of coal go beyond public health and the environment by also impacting Hoosier’s wallets. IPL can decide to retire some of its outdated, polluting coal burning units to prevent premature death and asthma in the Indianapolis community and invest in clean, renewable energy solutions. Instead, IPL wants to charge customers $606.1 million to upgrade their aging coal burning units at Harding St. and Petersburg. With the cost of coal rising and clean energy prices plummeting, utilities across the country move to add diversity in their energy mix. Despite this growing trend, IPL has no plans to invest in clean energy solutions in the foreseeable future. These upgrades could mean IPL would continue to burn dirty coal in Indianapolis for decades to come. Many Indianapolis residents feel they have paid the price for coal plant pollution in Indianapolis for far too long. IPL’s Harding Street coal plant has two smaller units that lack pollution controls, and the company has no specific retirement date set. These upgrades will fail to address dangerous carbon pollution and coal ash. IPL already has eight coal ash ponds located near the plant and the White River. The Environmental Protection Agency ranked some of these ponds as “high hazard” meaning that a failure could cause loss of life and/or property damage. “All the major faiths affirm the intrinsic worth of the planet and the call to cherish and keep it; they likewise call us to love our neighbors and act for the welfare of the vulnerable among us, who consistently suffer first and foremost when we abuse the environment,” said the Rev. T. Wyatt Watkins, Co-Pastor of Cumberland First Baptist Church in Indianapolis and Board Chair for Educational Programming for Hoosier Interfaith Power & Light. The group, who is partnered with CREDO Action, will continue gathering comments and petitions until January 28th calling on IPL to move beyond coal. Posted by Laura Arnold in Indiana Utility Regulatory Commission (IURC), Indianapolis Power and Light (IPL), IPL Rate REP. It is likely that many people missed this story by the Indianapolis Business Journal (IBJ) on the Wednesday before Thanksgiving. Although Chris O’Malley does not spell it out, this is all about proposed projects using the Indianapolis Power and Light (IPL) Rate REP or voluntary feed-in tariff (VFIT). There has been considerable speculation that there is both a second and third possible solar farm at the Indianapolis Airport. Many of you have already shared with me the rumors you have heard about who might be involved and where. I can’t or won’t share those rumors here on this blog right now. There is also considerable speculation and rumor about what is causing the delay in breaking ground to begin construction of the first solar energy farm at the Indianapolis airport. I will be writing more about the status of the IPL Rate REP program shortly. I will share with you the rumors I have heard if you tell me the rumors you have heard. Deal? Contact me via Laura.Arnold@IndianaDG.net or call (317) 635-1701. Original article: Airport could land second solar-energy farm | 2012-11-21 | Indianapolis Business Journal | IBJ.com. The Indianapolis Airport Authority is in talks that could lead to a second solar farm at Indianapolis International Airport. Discussions are taking place even as the initial solar farm has yet to get off the ground near the Interstate 70 airport exit. Airport officials won’t identify the firm or firms that would build a second solar farm. “Negotiations are still in progress,” said authority spokesman Carlo Bertolini. The second farm would consist of 60 acres, or the same amount as the first solar farm announced last year. “Regarding the location, the plan is that the second farm would be in the same vicinity as the first, but the boundaries have not been finalized,” Bertolini added. The first farm, announced in September 2011, has yet to show any signs of construction. ET Energy Solutions, a local consortium leasing 60 acres from the airport authority for the project, said last year that the 41,000 photovoltaic panels were expected to be operating in mid-2012. Information posted on ET Energy’s website said the farm had been expanded to 75 acres and construction would begin in early winter, pending approval from the Indiana Utility Regulatory Commission. The IURC granted approval Sept. 5. Airport officials referred questions to Kurt Schneider, vice president of ET Energy partner Johnson-Melloh Solutions, a local mechanical contractor. Schneider did not return phone calls seeking comment about the delay for the proposed $35 million project, but sent an e-mail late Wednesday morning saying that construction would start March 31, and that financing for the project was not an issue. Other ET partners are local companies Schmidt Associates and Telamon Corp. The first farm is expected to become one of the largest airport solar farms in the country, capable of producing more than 15 million kilowatt hours of power, or enough to power 1,200 average houses for a year. The power would be sold to Indianapolis Power & Light, with the airport authority expecting to collect about $316,000 annually in lease payments through its agreement with ET Energy. It’s likely a second farm also would generate substantial revenue for the airport authority, which is itching to find additional non-airline revenues as passenger traffic remains sluggish. A second solar farm operator might be under pressure to secure a contract sooner than later. IPL said in July that, beginning next March, it would throttle back on buying power from new customers that generate it from renewable sources. The utility will honor existing contracts for the duration of their terms. IPL pays from 7.5 cents per kilowatt hour for electricity from large wind turbines to 24 cents per kilowatt hour for solar projects. That’s effectively more than its own cost of generating power. The utility noted at the time that ratepayers shoulder the cost of buying renewable power, and paying more for renewable power would put additional pressure on them at a time when rates are expected to rise due to new federal environmental compliance rules. Posted by Laura Arnold in Feed-in Tariffs (FiT), Indiana Utility Regulatory Commission (IURC), IPL Rate REP, Northern Indiana Public Service Company (NIPSCO), Uncategorized. With the flurry of Interconnection Applications in Indiana to use both IPL’s Rate REP feed-in tariff and the NIPSCO feed-in tariff we can expect the total MW’s of solar PV installed to skyrocket in the next year. For example, an IPL customer will have 12 months from the approval of their Rate REP contract by the Indiana Utility Regulatory Commission (IURC) to actually install and connect their project to the grid. Given that IPL’s Rate REP program expires March 30, 2013, we will not completely see all the results of the IPL pilot program until March 30, 2014. Many of us who have reviewed the Open PV Project data reported on the NREL website believe there is under reporting of solar PV installations here in Indiana. This project depends entirely on voluntary reporting so please help us to increase awareness of this website and to encourage everyone to report their installations. In the meantime, I hope you find the following article from the SRECtrade Blog interesting. I encourage your questions and comments on how we can continue to promote solar PV and other distributed generation technology installations here in Indiana. One idea is to expand the concept of the NREL Open PV Project to include solar thermal, passive solar, geothermal and CHP installations throughout the State of Indiana. Such a comprehensive listing of renewable energy projects and distributed generation would certainly increase the understanding of the extent and importance of these energy technologies in our state. I plan to devote more attention to this project in future blog posts and in other on-line forums via Twitter, Facebook and LinkedIn. Will you help? Solar deployment is driven by state-level policies Solar deployment can also be tied to both federal and state-level energy policies that were enacted over the last decade (Energy Policy Act of 2005, the Federal 1603 Grant, California Solar Initiative, and SREC markets among myriad others) but the deployment seems to concentrate around some areas over others, suggesting that local and state factors outweigh the current federal incentive structure. 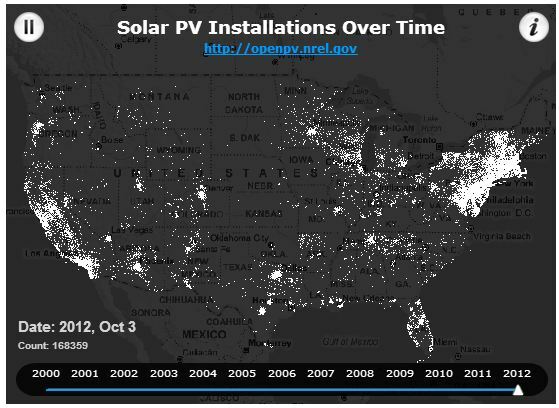 Viewing the NREL visualization only it looks like solar installation activity is predominantly in California from 2000 to 2004 with flashes of activity in Florida, the Rocky Mountain West, Minnesota/ Wisconsin, and what looks like the Tennessee Valley Authority region. 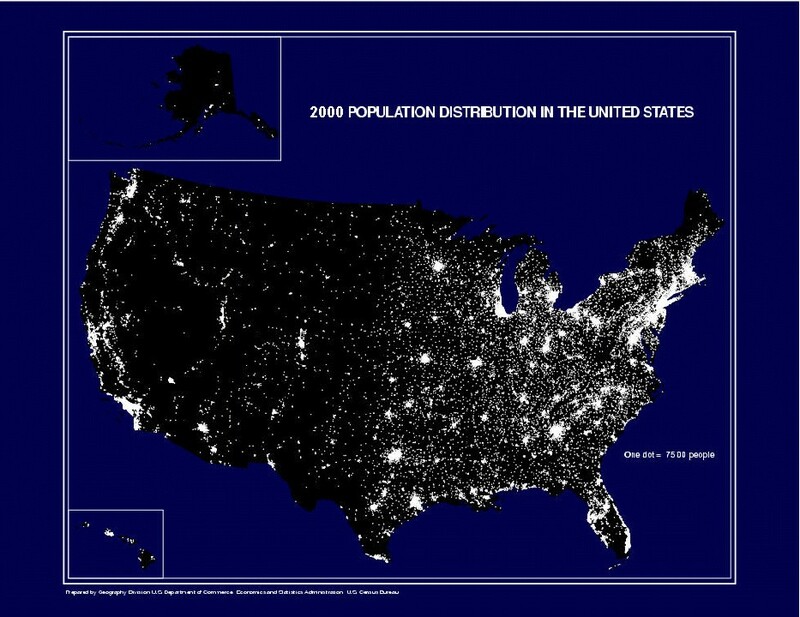 By 2007 solar installations appear to be widespread around major population centers around the country. The mid-Atlantic and the northeast states look as if they are exploding as their SREC markets come on line in the mid-2000s, while other areas seem to slow down. As an SREC company we know that each SREC market is different depending on the particular structure of the market as dictated by the policies that created the program. So perhaps not surprisingly we get phone calls and emails on a daily basis asking us about opportunities in states without comprehensive solar policies such as an SREC program. Our stock answer is to reach out to the state legislature and engage with grassroots activist groups like the Vote Solar Initiative. SREC markets are by no means perfect, but they are a key tool for states to drive solar development in the absence of a national standard. The end of the visualization shows the SREC market states (DC, DE, MA, MD, NJ, OH and PA) covering the map in white. Posted by Laura Arnold in Feed-in Tariffs (FiT), Indiana Utility Regulatory Commission (IURC), Indianapolis Power and Light (IPL), IPL Rate REP. The Indiana Utility Regulatory Commission (IURC) has on its agenda today (9/5/2012) for its weekly conference final approval for the Indianapolis Airport Authority (IAA) contract with Indianapolis Power and Light (IPL) for a 15 year feed-in tariff under Rate REP. The weekly conference by Indiana regulators is expected to approve the 30 day filing. Details will be available later this afternoon. Contact Laura Ann Arnold at Laura.Arnold@indianaDG.net for a copy of the approved contract. I wrote about the RFP IPL issued for this plant on 7/9/2012. See http://wp.me/pMRZi-L9 for the details on the RFP. The Moorseville-Decatur Times reporter 9/1/2012 that Morgan County is one of three sites being considered for the new IPL plant. I don’t recall seeing an IPL news release saying who had the winning proposal or bid. If anyone else knows, please tell me. When I find out, I will post the information here on this blog. The Morgan County Council is offering Indianapolis Power & Light Co. an economic incentive package if the utility chooses the area for a new energy project. IPL is considering several locations for a Combined Cycle Gas Turbine energy plant. Martinsville, Ind. — The Morgan County Council today introduced an economic benefits package for Indianapolis Power & Light Company (IPL), contingent upon IPL building a significant new energy project north of Martinsville. The proposed energy project could yield an estimated $1.1 to $1.6 million in annual economic tax benefits to Morgan County over the next ten years. Tax revenues would be used to benefit Morgan County schools, roads and other county infrastructure. To meet new EPA standards, IPL is investigating a variety of new electricity generation and energy efficiency programs, and one of the many options under consideration is building a Combined Cycle Gas Turbine (CCGT) energy plant in Morgan County on IPL’s existing North Martinsville property. If built, the new energy plant will replace about 600 megawatts (MW) of energy that will likely be lost as IPL retires several of its coal-fired, smaller and older energy generating units due to new environmental regulations. IPL issued a request for proposals for a CCGT this past June. About one-third of Morgan County residents and businesses are served by IPL. Source: Morgan County Economic Development Corp.